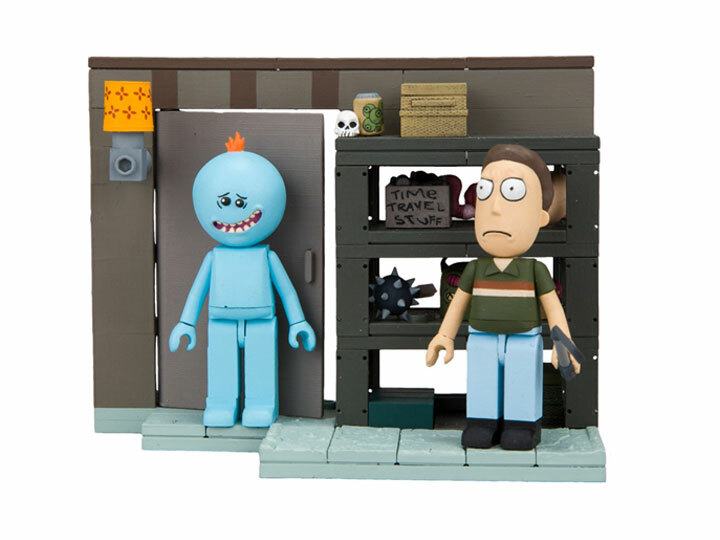 Tired of solving all of their problems, Rick provides the Smith family with a Meeseeks box. When pressed, a "Meeseeks" appears designated with the sole purpose of solving tasks. After accomplishing their tasks, the Meeseeks disappear and vanish from existence. The tasks must be simple though, as existence is extremely painful for Meeseeks. 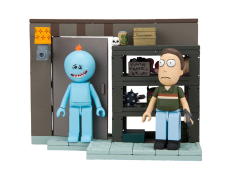 The Rick and Morty construction sets feature buildable figures and playsets inspired by Dan Harmon and Justin Roiland's Rick and Morty television series. The figures feature articulation in the main joints and have swappable heads/limbs. The bricks and figures are compatible with other construction brands. The Smith Garage Rack set contains approximately 109 pieces.